Last week, Georges St-Pierre came under heavy fire from keyboard warriors after he suggested a move up to middleweight might not be in the cards. While the UFC welterweight king spotlighted the need to properly pack on additional pounds as his primary deterrent, fanboys across the globe perceived his backpedalling as a sign of fear. IF you move up to middleweight? 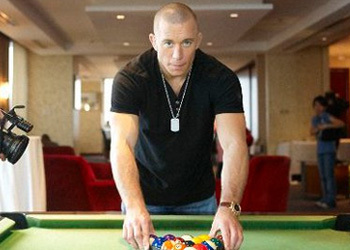 GSP owns a dominant 21-2 record and has convincingly defended his throne five consecutive times. Furthermore, it could be argued he already lapped the welterweight field after hanging a second unanimous decision victory on Josh Koscheck. Because of their overwhelming size difference, St-Pierre suggested the two superstars could meet in a fictitious weight class somewhere in between. If that’s the case, no title belt would be on the line. A catchweight contest wouldn’t be the worst alternative if the UFC is hell-bent on arranging the biggest fight in mixed martial arts history before year’s end. Specifically since Octagon president Dana White previously suggested certain non-championship affairs could still be five-round matchups. On a completely unrelated side note that has absolutely nothing to do with GSP’s future, St-Pierre defends his welterweight title against Jake Shields at UFC 129 on April 30th. I wonder what the former Strikeforce champ and his 15-fight winning streak make of all this?